Recently we announced that SAP Cloud Platform is transitioning from Beta to general availability on Azure. SAP Cloud Platform (SAP CP) is SAP's multi-cloud platform-as-a-service offering and is now available for production use in Azure West Europe. Leverage a broad range of certified SAP HANA offerings on Azure. Integrate with Azure-Native Services such as EventHubs, AzureSQL Database, Azure CosmosDB, Azure ServiceBus etc., using Meta Azure Service Broker. To get started with SAP CP on Azure, login to your SAP CP account. 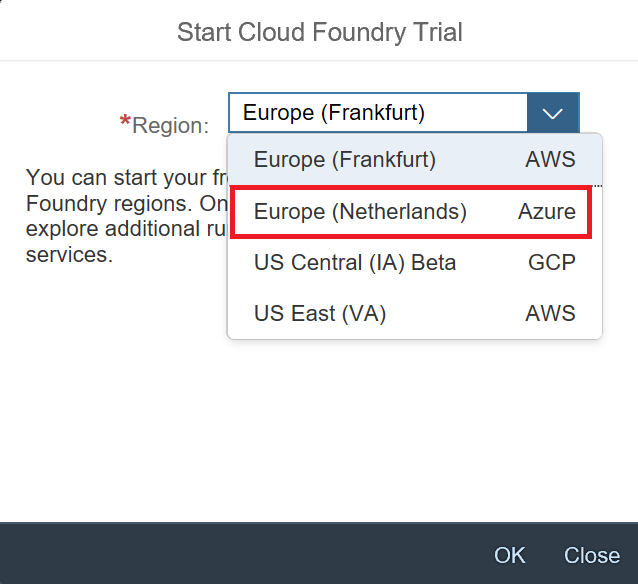 Pick Cloud Foundry and select Europe (Netherlands) Azure region. This will create an Organization and Space within the SAP CP Cloud Foundry environment. Developers can use either the SAP CP cockpit or Cloud Foundry CLI to deploy and manage their applications and services. SAP CP cockpit provides a convenient way to browse and monitor deployed applications. Developers can use cockpit to browse through the catalog of infrastructure services enabled by SAP under the Service Marketplace. These services leverage Azure Virtual Machines for infrastructure, even configuring use of Azure Availability Zones for high availability. Since SAP CP is a Cloud Foundry based PaaS enabled for SAP infrastructure, you can manage your SAP CP environments just like any other Cloud Foundry environment. For SAP-specific services such as HANA, SAP provides plug-ins such as the HANA MTA plug-in for the Cloud Foundry CLI to make it easier to work with SAP-specific services. You can use all Cloud Foundry CLI/APIs to push apps, explore marketplace, and more. Meta Azure Service Broker (MASB) lets you provision Azure Platform Services directly from Cloud Foundry. MASB GitHub page provides steps to install the service broker on Cloud Foundry. You can also use Open Service Broker, which is currently in preview but will eventually replace MASB for your productive environments. Once you've installed MASB, Azure Services will become available in Service Marketplace. You can use Cloud Foundry CLI or SAP CP cockpit to browse the services available. The above shows all Azure services enabled in addition to the services enabled by SAP. You can now start using the services exposed by MASB for Azure. 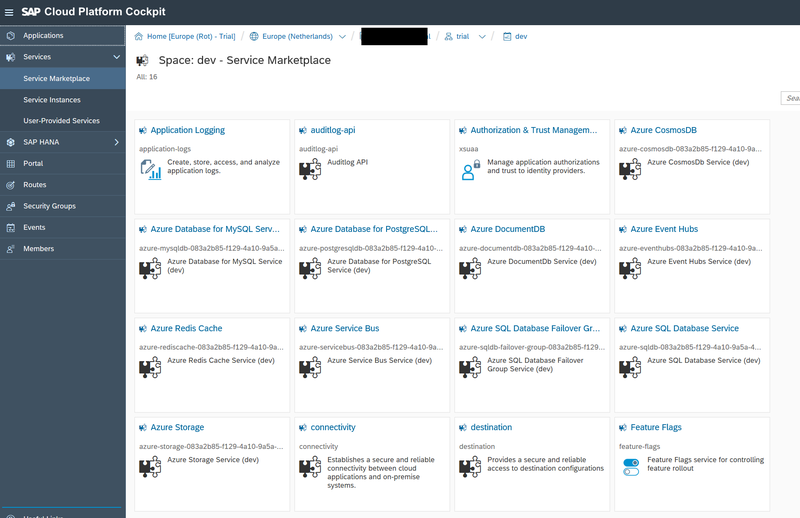 Connecting to Azure Platform services in the Marketplace follows standard Cloud Foundry patterns with Service Brokers. You create a service, and then bind the service to one or many applications using the Cloud Foundry service broker APIs and CLI. Create in progress. Use 'cf services' or 'cf service samplecosmosdb' to check operation status. Attention: The plan `standard` of service `azure-cosmosdb- xxxxxxx-xxxx-xxxx-xxxx-45337ac75764` is not free. The instance `samplecosmosdb` will incur a cost. Contact your administrator if you think this is in error. Finally, by using the cf bind-service command, you can bind the service to any application you've deployed. Configuration parameters will then be exposed through environment variables as per the documentation of the respective service in the Meta Azure Service Broker GitHub. All the above steps can be carried out using SAP Cloud Platform Cockpit, as well. We expect more Azure regions to become available soon for SAP development using SAP Cloud Platform. As more and more service light up on Open Service Broker for Azure, it will graduate and eventually replace Meta Azure Service Broker. We expect more regions, along with ability to connect to more Azure Services would effectively round out your SAP Cloud development requirements.